I figured I'd better get this posted before the kitty completely wrecked it by knocking it repeatedly off my display table, batting it around the floor, and chewing it to death! Start with 8-1/2"x12" paper or card stock. Our 12x12 Designer Series Papers are ideal, not only for size, but also because of the contrast the double-sided patterns provide. Score parallel to the 8-1/2" side at 1-1/4", 2-1/2", 5", 7", 9-1/2", and 10-3/4". Score parallel to the 12" side at 2-1/2" and at 6". Cut the 2-1/2" squares from each corner. Fold the four center corners in half diagonally, each tip pointing towards the center. Fold in the short sides. Fold in the long sides. Fold back each top edge. Punch holes thru top for string or bow. 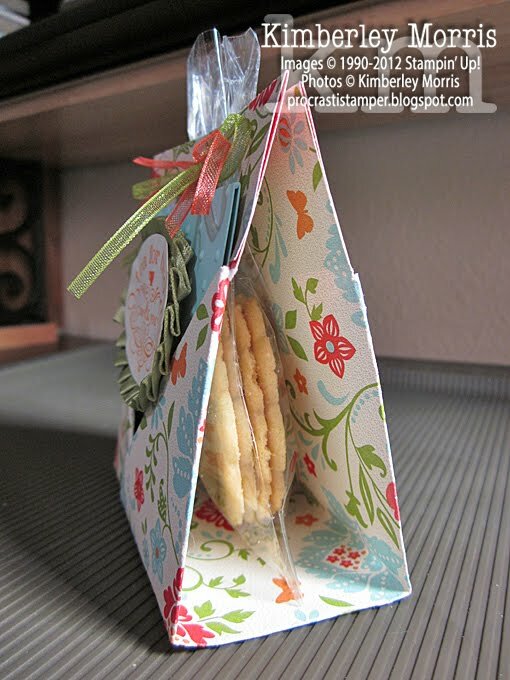 If you want to put treats in a bag in the center, punch your holes close together, so they can gather the top of your bag when you pull them tight. Okay, I'm gonna show you a quick video walk-through for a visual. I know you're a busy crafter, so I'll keep it short and to the point. I'm a busy crafter, too, so please excuse the rough cut of the video. Really, you should only need to see it once, and after that, you'll easily be able to refer to the text instructions above. 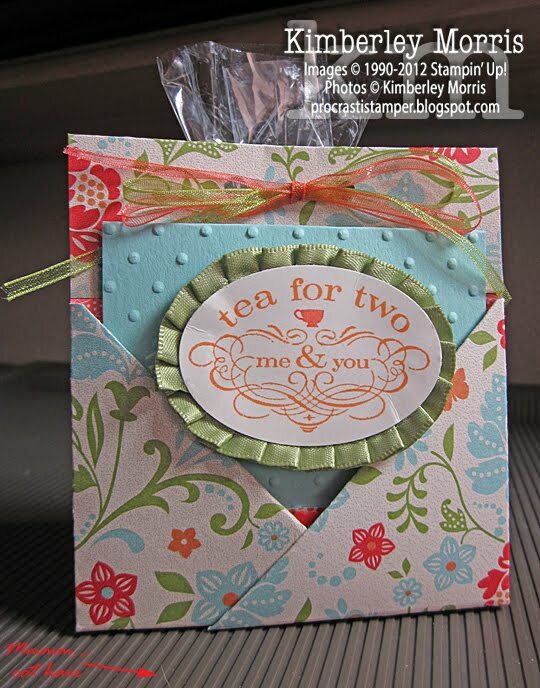 Seriously, you NEED the FREE Everyday Enchantment Designer Series Paper, and the FREE Everyday Enchantment Ribbon & Brad Pack for this project. During Sale-a-Bration, you can pick one item FREE for each $50 you spend, or if you Host a Workshop with $400 in sales, you get the paper, ribbon/brad pack, AND a coordinating stamp set...ALL FOR FREE! 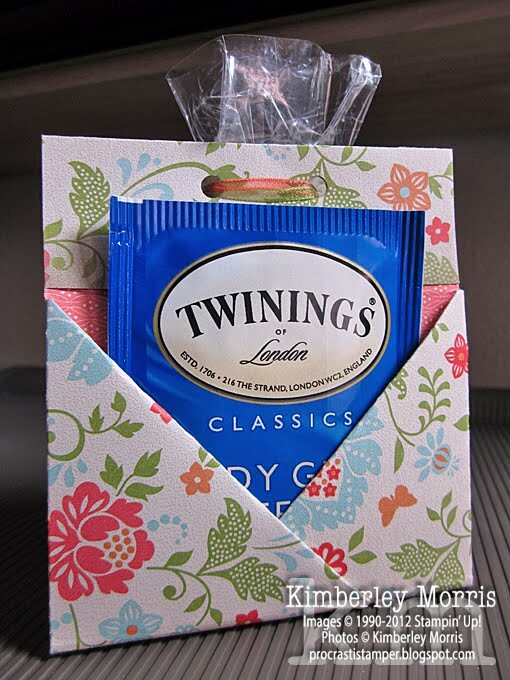 My teenage daughter is not a froo-froo person, but immediately upon seeing this project, she said the paper and the coordinating ribbon make this project scream "Mother's Day". But the FREE supplies are only available through March 31st, so get yours NOW! Stampin' Supplies: Everyday Enchantment Designer Series Paper, Everyday Enchantment Ribbon & Brad Pack, Simply Scored Scoring Tool, Small Cello Bag (3x5), Crop-a-Dile. 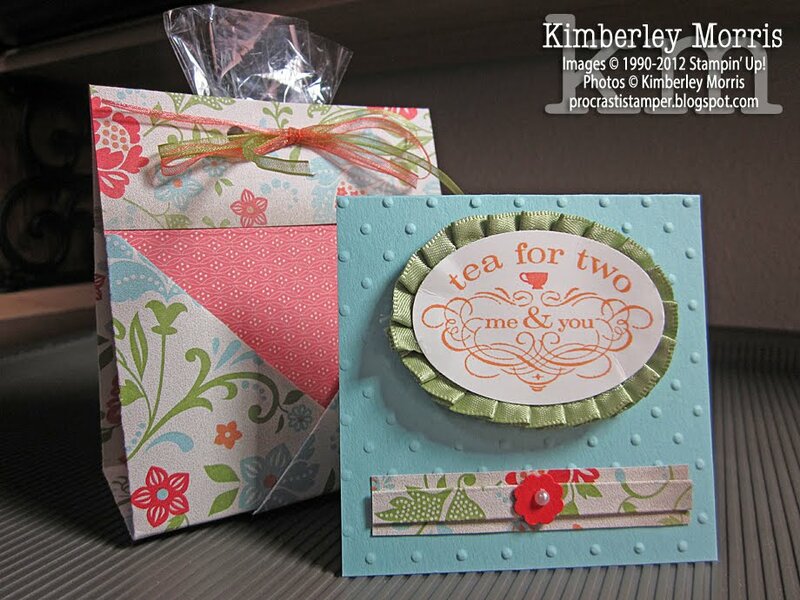 [And for the card...] Pool Party card stock, Very Vanilla card stock, Peach Parfait & Calypso Coral ink, Itty Bitty Punch Pack, Pearl Jewels, Pear Pizzazz Pleated Satin Ribbon, Tea Shoppe stamp set, XL Oval Punch, Perfect Polka Dots Embossing Folder, Stampin' Dimensionals, SNAIL. The box was made at a club meeting that another demonstrator graciously allowed me to attend. It was inspired by the little journal in the Sale-a-Bration brochure, on page 6. 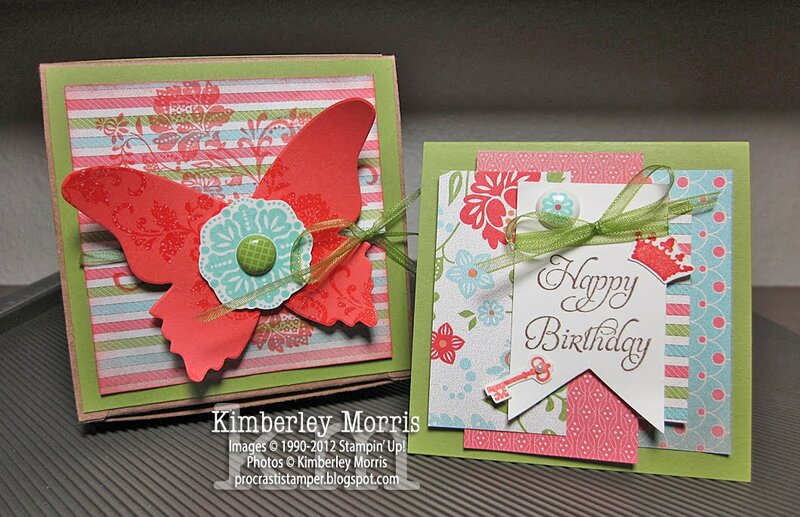 The card is one I made, which was inspired by the 3x3 card, also in the Sale-a-Bration brochure, on page 3. (Click HERE to download the brochure for free!) If you need a hard copy of the Sale-a-Bration brochure, and would like to be on my mailing list, just drop me an email and let me know. One of my New Year's Resolutions was to post to my blog more regularly. Another of them was to get a little more organized. So, I'm trying to make a dent in each today by posting a quick card, before finally forcing myself to take the holiday decorations down & get them stored back in the garage (brrr, it's cold out there today!). 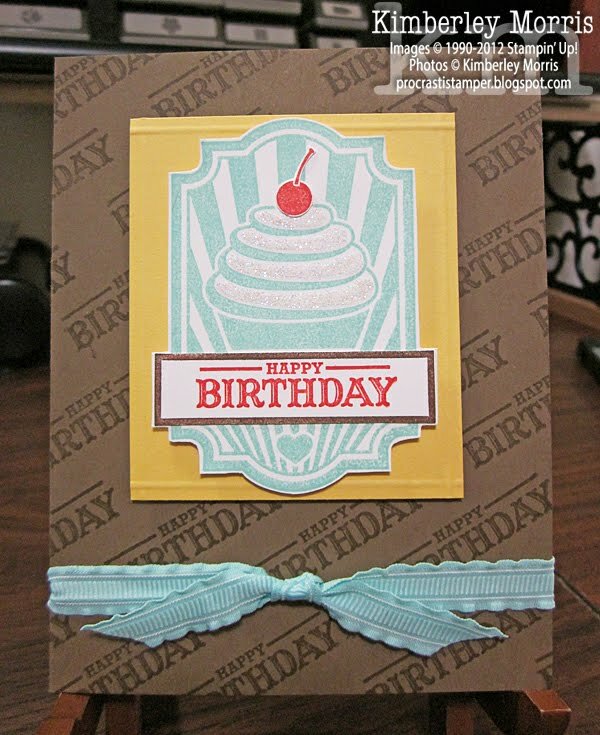 Stampin' Supplies: Sweet Cake stamp set, Soft Suede card stock, Daffodil Delight card stock, Whisper White card stock, Pool Party ink & ribbon, Poppy Parade ink, VersaMark ink, Two-Way Glue Pen, Dazzling Diamonds Glitter, Simply Scored Scoring Tool, Stampin' Dimensionals. Check out the Sweet Shop Collection in my Online Store to see more fun candy & cupcake coordinating products! You can download My Digital Studio Express starting TODAY for a FREE 30-Day Trial, with no obligation...no credit card number required. My Digital Studio is Stampin' Up! 's digital designing software. My Digital Studio Express is the downloadable version of the full My Digital Studio program, with a little less image content than the physical version (which comes on discs). The program works with layers, similar to a Photoshop program. Check out the Stampin' Up! videos on MyDigitalStudio.net to see how it works first, and then browse the rest of the videos to see what else you can do with it! To Download Your FREE 30-Day Trial Now, click HERE. Click HERE to see the Digital Content/Images included in My Digital Studio Express. Click HERE to see Frequently Asked Questions regarding the 30-Day Free Trial. I have to put in a quick word here for My Digital Studio...when it first came out, I was not interested at all, because I LOVE putting my hands on real product. 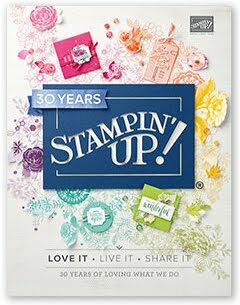 But since My Digital Studio uses the Stampin' Up! exclusive images and coordinating colors, I still feel like I am creating something of my own. With the drop shadows and photo mats, there is texture and depth, and it's just a lot of FUN! In most cases, with a few changes in print settings, you can even print your projects at home. This is SOOO convenient when you'd like to have a pre-printed background, but don't own the actual physical patterned paper you'd like to use. And the pre-designed albums are fantastic when you want to drop some pictures in, and complete a project in a hurry. The cool thing is that you can modify the templates, so you can do things like remove flower embellishments, and just put in stars, to change a feminine layout to an all-purpose layout, or remove entire pages if you don't want to use them. Anyway, I could talk about it all day, but it's so much better if you experience it for yourself. By the way, you can print out any and every project you make during the trial period, using Stampin' Up! 's professional print services, if you'd like. I will share one big hint--take the time to save each page/project as a full-size .jpg file when you finish it...that way, even if you decide not to keep using My Digital Studio Express after the free trial period is over, you will still have copies of your work that you can access to print on your own. Just email me if you need to learn how to save those .jpg copies.